There are lots of very good reasons the Leek is one of the most popular Kershaws. For one thing, the slim blade is remarkably versatile. This modified drop-point blade shape gives it good slicing capabilities, while the slim tip lets it excel at piercing and detail work. There are lots of very good reasons the Leek is one of the most popular Kershaws. For one thing, the slim blade is remarkably versatile. This modified drop-point blade shape gives it good slicing capabilities, while the slim tip lets it excel at piercing and detail work. The blade steel is high-performance Sandvik 14C28N stainless that sharpens to a razor edge and holds the edge for a good long time. The 3-inch blade is perfect for most day-to-day tasks. Leek lovers also love the fast and easy opening provided by SpeedSafe assisted opening. 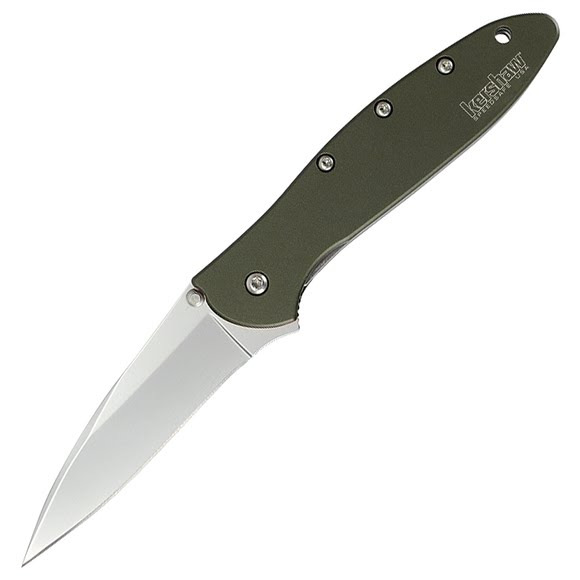 Whether you&apos;re left-handed or right-handed, a simple pull back on the ambidextrous flipper or push outward on the thumbstud and the Leek&apos;s blade is ready to go to work. But the newest and most obvious thing about this Leek is the new olive drab handle color. The color is eye-catching and different, but also discrete. The olive drab color is fade-resistant, scratch-resistant, and permanently bonded to the anodized aluminum - so it looks good now and looks good later, too. For safety, a locking liner keeps the blade locked open during use and a Tip-Lock slider locks it closed when folded. The pocketclip is reversible for tip-up or tip-down carry and the handle is drilled to accept a lanyard. This slim, easy-to-carry design, with plenty of cutting versatility just may be the perfect EDC. Locks the blade open during use; one side of the knife&apos;s steel "liner," the steel plate to which the handle scales are attached, moves into position behind the blade to securely lock it open. Overall Length 7", Closed: 4"